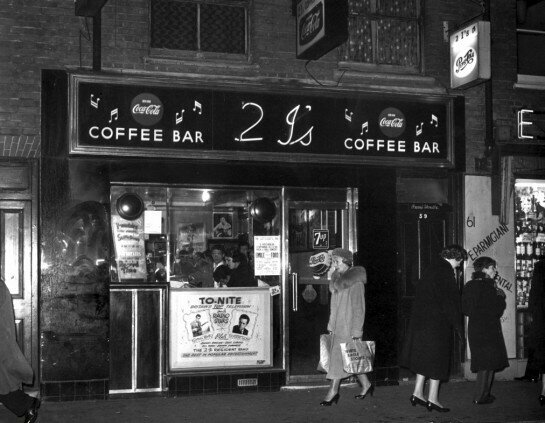 History of the famous 2I's Coffee Bar on Old Compton Street, Soho - Birthplace of British Rock'n' Roll. 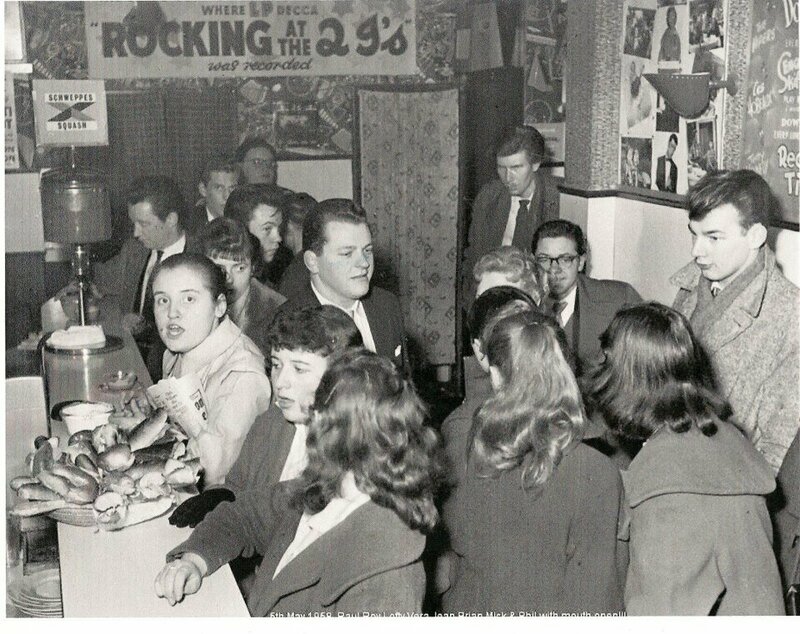 Situated at 59 Old Compton Street, in London's Soho district, the 2i's Coffee Bar was the place where the first big Skiffle and British Rock 'n' Roll stars performed and were discovered from 1956 to 1962. The 2i's Coffee Bar had live music and several home grown British Rock n Roll stars were discovered or performed at the coffee bar, with big and well known names which included: The Vipers Skiffle Group, Tommy Steele, Marty Wilde, Cliff Richard & the Drifters (later Shadows), Vince Eager, Vince Taylor, Terry Dene, Wee Willie Harris, Carlo Little, Joe Brown, Eden Kane, Screaming Lord Sutch, Jay Chance, Tony Sheridan, Johnny Kidd, Jet Harris, Paul Gadd (later to be known as Paul Raven and then Gary Glitter), Dene Lincoln, Ritchie Blackmore, Alex Wharton, Mickie Most and Big Jim Sullivan. The expresso coffee bar, run by two Australian ex-wrestlers Paul Lincoln (aka 'Dr Death') and Ray Hunter, opened its doors on April 22nd 1956. It was named after two brothers called Irani who originally owned the cafe'. The coffee shop had live music in its basement with a small 18 inch stage where Lincoln and Hunter started putting on Skiffle groups. The Vipers were the first who held a residency at the "Two I's" and it was during one of their performances that Tommy Steele was spotted then became the first British rock star. The original Drifters: Terry Smart, Harry Webb, Ian Samwell & Norman Mitham downstairs in the cellar beneath the 2i's Coffee Bar. Soon after it became a focal point for Rock'n'Roll enthusiasts, the most famous music venue in England. Not only for having been witness of the emerging British Skiffle then Rock 'n''Roll scenes but also for having been an essential meeting point between artists and their career-makers. Bill Kent (real name David Kingsman from Maidstone, Kent) entertaining the Ladies at the 2 I's. His big break came in 1958 when a tape was heard, by top London Agent Hyman Zhal of Fosters Agency Piaccadilly Circus, London. He wanted a singer, to replace Terry Dene . After the audition at Max Rehearsal rooms, Soho. Hymy Zhal signed his new boy up. He was sole booking agent for Paul Lincoln who owned The 2Is, coffee bar and was to become his booking manager and with Bob Harvey his personal manager. Young aspiring rock musicians came to the ?Two Eyes? from all over the country, hoping to find fame and fortune because it was the place to be spotted by impresarios and promoters such as Jack Good, Larry Parnes or Don Arden. It was also a real cradle for some artists such as Cliff Richard and the Drifters (later Shadows) and Vince Taylor and his Playboys, who all met by being regulars there. According to an article in Time Skiffle was brand-new to the UK, and in particular at the 2i's and another coffee bar nearby, The Cat's Whisker where "Soho hipsters swelter and suffocate for it... and..."generally the musicians were paid with coffee and Cokes". The fabulous Terry Dene, another famous British Rock 'n' Roller who got his break at the 2i's By 1960, Tom Littlewood, a Judo instructor by profession, became its new manager. He managed some of the main acts performing there such as Vince Taylor and promoted some road shows throughout the country until the early sixties. Led Zeppelin's manager, Peter Grant was a bouncer at the 2i's prior to his career in the music business. During the mid sixties, at the height of the Beatlemania, the days of the 2 I's as a leading Rock ?n? Roll venue were numbered. At that time, the scene had changed to the effect that the successful groups such as the Beatles or the Rolling Stones who would play large halls, or even stadiums, had become far too expensive for club appearances, and when most clubs had been transformed into discoth?ques. The 2i's pictured in the early to mid 1960's. The ?Two Eyes? finally closed its doors in 1967. Later the place was known as the Dome Caf? Bar. Today it is known as the Boulevard Bar and Dining Room. The basement is now just a lobby area. East End Mark, Slasher and Big Chris Outside the old 2i's on September 18th 2006. On September 18th 2006, a Green Plaque was at last unveiled at 59 Old Compton Street by Westminster City Council to commemorate the existence of the legendary venue that witnessed the birth and rise of the first wave of the British Rock scene. Wee Willie Harris was born as Charles William Harris, 25 March 1933, Bermondsey, London. He is best known for his energetic stage shows and TV performances since the 1950s, when he was known as "Britain's wild man of rock 'n' roll". Working a job as a pudding mixer at Peek Freans' London bakery, Harris turned professional musician after realising he could make more money singing. He began performing at the 2i's Coffee Bar where he was the resident piano player, performing with Tommy Steele, Adam Faith, Screaming Lord Sutch and others. He was named for his 5' 2" height. In November 1957 he was picked by the TV producer, Jack Good, to appear in the BBC show Six-Five Special. His appearances on the show led to concerns being expressed in the media about the BBC's role in "promoting teenage decadence". His debut single, "Rockin' At the 2 I's", was released on the Decca label in December 1957, and was followed by several others, although none reached the UK Singles Chart. He became a popular performer on TV shows and in live performances, and was known for his unrelenting energy, multicoloured dyed hair (often green, orange or pink), and clothes including "larger-than-life stage jackets that looked like the coat hanger was still inside, tight drainpipe trousers, and a huge polka-dot bow tie". Another critic wrote that: "He gyrates like an exploding Catherine wheel, emitting growls, squeals and what sounds like severe hiccupping". Paul McCartney and John Lennon reportedly queued for his autograph when he played in Liverpool in 1958. In May 1960 he supported Conway Twitty, Freddy Cannon and Johnny Preston on a UK tour. He continued to record in the 1960s, for HMV, Polydor and Parlophone, and continued to perform in the UK as well as in Israel, Spain and elsewhere, and on cruise ships. Tommy Steele Thomas Hicks aka ?Tommy Steele?, the first British Rock star, was discovered by his soon-to-be Manager John Kennedy in September 1956 during a 2i?s session with the Vipers. Paul Lincoln, the owner of the Two I's, had invited John Kennedy to listen to "The Vipers skiffle group". Kennedy wasn?t very impressed by the Vipers but his attention was captured by the performance of Hicks who took to the stage during a break in the Vipers performance and started shouting "alright kids...lets go..." then singing Elvis Presley?s number "Heartbreak Hotel", and a huge hit in the states in early 1956. After a repeat performance in the Two I's, Hugh Mendle, the A&R man for Decca Records, asked Kennedy to bring Hicks with him to do a Decca sound test was planned for the following day. The following month ?Rock with the Cavemen? was released? Terry Dene Terry Dene was born as Terence Williams on 20 December 1938 in Elephant & Castle, London. 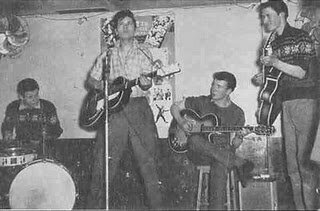 During 1956 and 1957, Terry Dene, worked as a packer at HMV?s Oxford Street record shop and was spotted by Rock and Roll impresario Jack Good while singing at the 2 I's where he tried to emulate Elvis Presley and Gene Vincent. This made his friend bass player Brian Gregg all the more determined to make it himself. He obtained an opportunity to record with Decca and to find a weekly spot on TV's "Six-Five Special". Paul Lincoln rated his chances high enough to become "the next Tommy Steele". Later Terry Dene was backed on stage by his own backing band, the Dene Aces, evolving out of the Terry Kennedy Rock?n?Rollers and featuring the great drummer Clem Cattini. Paul Lincoln booked them after he saw them in the movie ?The Golden Disc?. Adam Faith Terence Terry Nelhams-Wright was born at 4 Churchfield Road, Acton, London. He was unaware his surname was Nelhams-Wright until he applied for a passport and obtained his birth certificate. He was known as Terry Nelhams. The third in a family of five children, Nelhams grew up in a council house in a working class area of London, where he attended John Perryn Junior school. He started work at 12, delivering and selling newspapers while still at school. His first full-time job was odd-job boy for a silk screen printer. Faith became one of Britain's significant early pop stars. At the time, he was distinctive for his hiccupping glottal stops and exaggerated pronunciation. He did not write his own material, and much of his early success was through partnership with songwriter Les Vandyke and John Barry, whose arrangements were inspired by Don Costa's pizzicato arrangements for Buddy Holly's "It Doesn't Matter Anymore". Faith began his musical career in 1957, while working as a film cutter in London in the hope of becoming an actor, singing with and managing a skiffle group, The Worried Men. The group played in Soho coffee bars after work, and became the resident band at The 2i's Coffee Bar, where they appeared on the BBC Television live music programme Six-Five Special. The producer, Jack Good, was impressed by the singer and arranged a solo recording contract with HMV under the name Adam Faith. His debut record "(Got a) Heartsick Feeling" and "Brother Heartache and Sister Tears" in January 1958, failed to make the charts. Good gave him a part in the stage show of Six-Five Special, along with The John Barry Seven but the show folded after four performances. His second release later that year was a cover of Jerry Lee Lewis' "High School Confidential", backed with the Burt Bacharach and Hal David penned "Country Music Holiday", but this also failed. Guitarist Rick Hardy aka Rick Richards took over him, leading The Worried Men until early 1959. Cliff Richard John Foster managed to get the Drifters a slot at the 2 I's in early 1958. As Rick Richards had an amplified guitar and the 'Drifters' didn't, he was roped in to play with the group there. A few weeks later, their lead vocalist, Harry Webb came back to the 2.I's with a new name obviously pinched from Rick?s stage name: ?Cliff Richard?. Rick Hardy was finally replaced by Ian Samwell, who volunteered his services as a guitarist during a gig at the 2 I?s, then penned the first Cliff?s hit, ?Move It?. The rest is history - see the forthcoming page on the history of Cliff Richard & the Drifters to be developed soon. Vince Eager Following their appearance in the televised skiffle final in late 1957, the Vagabonds from Grantham were invited to play at the 2 I's Coffee Bar. The response from the audience to their show prompted the owners of the 2 I's to offer them a residency. They decided to take up the residency offer at the 2 I's Coffee Bar and soon after they were offered a Sunday Night concert in Coventry by Larry Parnes who offered Roy Taylor, the lead vocalist, a deal. It involved Roy became Vince Eager. During summer 1958, Vince Eager would be back by a band that became Marty Wilde?s Wildcats. Vince Taylor After a two month tour in Yorkshire, Marty Wilde finally split the Wildcats and some of them ended up coing back to the fold: playing at the 2 I's. They teamed up there with Tony Sheridan who turned down the offer to be the lead guitarist for the Drifters. Vince Taylor came in looking for a band to back him on a few shows and they became his Playboys. In late 1959, Sheridan left and was replaced by another guitar hero Joe Moretti of ?Shakin? All Over? fame (Johnny Kidd & The Pirates). Joe Moretti comments: ?Vince decided on the uniforms: black shirt,black pants,black & white shoes with white tie black & white check cap. We looked a million dollars. And we didn't just wear them on stage. We wore them all the time !! And when we walked into the 2 I's everyone went crazy. So, very quickly we became identifiable. Vince Taylor & the Playboys. And soon we were the main attraction at the 2 I's. Now, the Room where we played at the 2 I's was below ground level, a basement under the main cafe. I think it was meant to hold about 40 people but it was always packed with people standing shoulder to shoulder. The heat & the sweat !!? Other great musicians had their first big break at the 2 I's such as pianist Wee Willie Harris with his pink hair, drummer Rory Blackwell and his fabulous long drums solos.